If you are looking for a heavy duty surge protector in a sleek package, you've come to the right place my friend. With a robust 3420J of surge protection & 8 AC outlets, you'll be able to power and protect all your stuff. Low profile design is only an inch thick, and will look great anywhere you put it. 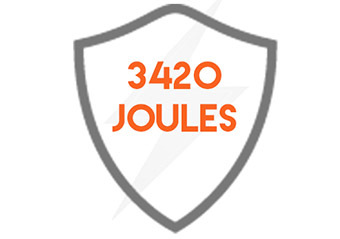 With 3420 Joules of premium surge protection, you can power and protect up to 8 devices at once. Rest easy, 3420J will protect all your expensive electronics for a long time. Low profile design is easily concealable behind or under furniture. Not using an outlet? The built-in safety covers keep your neighbor's kid from jamming paper clips into it. Keeps your gear running better, longer by filtering harmful signals out of your power supply. 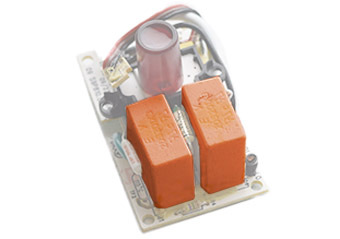 Built with fire-proof MOVs (they absorb the extra voltage) to keep your house safe. Even your monster sized plugs are welcome here. 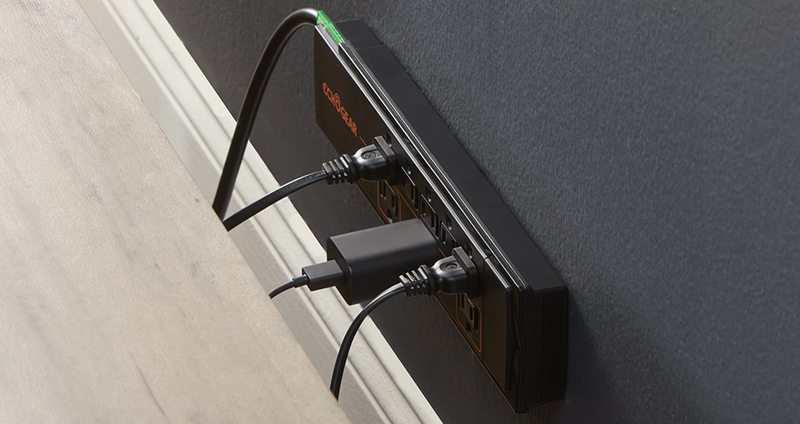 With extra space between 3 of the outlets, you'll avoid blocking other plugs. 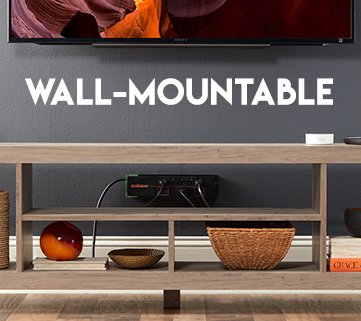 Wall mountable design let's you get power wherever you need it. Don't worry! We've been tested...for safety. UL certified surge protector includes a 5-year, $25k connected equipment warranty. 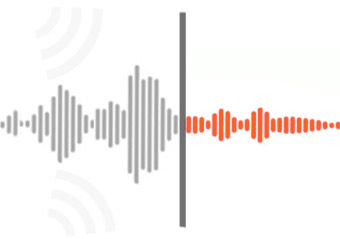 Get amped about Echogear surge protection. Pun intended. If you are just pretending to understand the details of surge protection to impress your friends, we've got your back. Joules represents the number of surges a power strip can take before it needs to be replaced. This one's got 3420 Joules, which is an insane amount. It'll keep all your stuff protected longer than other products. On top of that, we added in fire-proof MOVs (Metal Oxide Varistors). What the hell is a MOV? MOVs are like the sponge that absorbs all the extra voltage during a power surge. We encased them in fire-proof ceramic to keep your whole fam safe in the event of a catastrophic power surge. Talk about value. In addition to providing A+ surge protection, this low-profile power strip is easy to conceal under furniture or fit nicely on a desk. 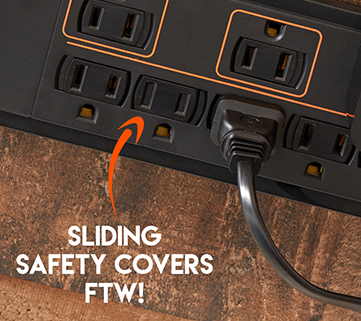 No more awkwardly shaped surge protectors wrecking your home's modern look. You'll get heavy duty surge protection in a slim package. Plus, the suave black finish makes it a Batmobile-worthy accessory. But not for the Ben Affleck Batman, he disgraces the name of Bruce Wayne #NotMyBatman. If you think the slim design means fewer features then you are mistaken. We packed this thing with everything you want in a power strip, and even a few things you never knew you needed. First off, it'll keep your gear running longer. Seem too good to be true? Well, we don't know how to tell you this, but you have dirty power. Appliances in your home (like a refrigerator) cause interference in the power supply that can degrade electronics over time. This surge protector delivers clean power by filtering the signal before it gets to your gear, ensuring it performs perfectly. Don't need all 8 outlets at once? Use the built-in covers to keep them closed & prevent accidental shocks. Because if you are going to shock yourself, it should be on purpose. If you want to keep the power strip completely out of the way, it's mountable using the 4 keyhole slots on the back. Put it behind your TV, up on your workbench, or wherever else you need clean protected power. With the DeAndre Hopkins sized power cord (6' long), you'll be able to reach any nearby outlet. 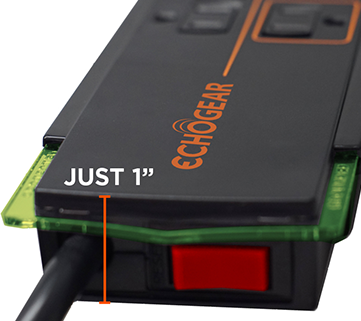 So, the product has everything you need but there's even more to love with Echogear. We tested this product to UL standards for safety & reliability, so you know you're getting a quality product. Integrated lights let you know your stuff is protected. Joule Rating: Think of Joules as the number of surges the power strip can take. Higher rating = longer lasting protection. 3420J is a top-tier rating. Click the button below to add the Low Profile Power Strip With Heavy Duty Surge Protection to your wish list.